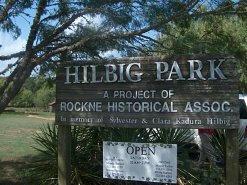 Hilbig Park in Rockne was named to memorialize Hilbig Park School; a school that served the German Catholic children of the Rockne community between the years of 1894 to 1900. The land for this school was donated by Anton Hilbig and his wife, Carolina, who emigrated from Kospendorf, Prussia, in 1871. The school was located across the road from the Hilbig home on what is now Goertz Road. In the deed, recorded in the Bastrop County Court House, the trustees of the school were Joseph Rathmann, John Goertz, and Albert Beck. On June 24, 1992, Charlie and Marian Hilbig Nelson donated a plot of land near the church in memory of Sylvester J. "Vester" and Clara Kadura Hilbig. 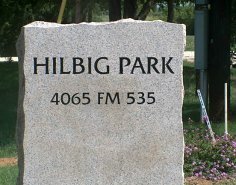 It also honors the memory of Fred Hilbig who gave much to the community through the Wm. Hilbig & Sons General Store. Because of the store, the Rockne community went by the name of Hilbigville from 1922 to 1931 until it was given the name Rockne.